保護, 修復, 護膚, 護唇, 鎮定和補水, 創傷導致的傷痕、傷口或疼痛, 座痤瘡, 痘痘, 極乾燥嘴唇, 曬傷, 燙傷, 補水、滋養皮膚, 瘙癢、乾裂皮膚,破損皮膚, 鼻炎, 預防及治療, 並呵護表皮, 呵護手指甲, 腳趾甲, 保濕 眼周邊, 濕疹, 嬰兒濕疹, 剃鬚引起的皮疹, 防止皮膚老化, 皮膚炎, 妝前護膚, 乾裂或破裂的腳部皮膚, 礫石皮疹等皮膚炎症, 牛皮癬, 皮疹, 給皮膚的夜間睡眠護理! 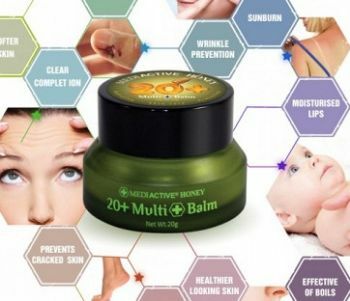 Mediactive® Active 20+ Multi-balm is a versatile skin care solution for chapped, dry or broken skin on the lips, face and body. 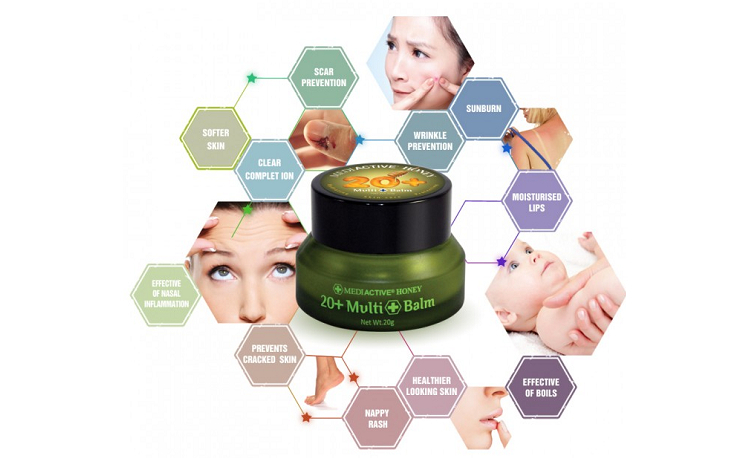 Multi-balm is suitable for use on all kinds of skin types and all skin conditions of all ages including children.The 20+ Multi Balm signature contains super high antioxidants, natural nutrients and antibacterial properties to protect, hydrate and soothe the skin.The 20+Multi Balm deeply moisturizes, hydrates the skin and gives mature skin the suppleness it requires, helping to prevent the signs of wrinkles. Nourishing balm keeps your skin feeling soft, supple, and smooth to the touch. Mediactive® Active 20+ Honey is Antibacterial Australian Honey registered on ARTG, which is in rare and short supply because of diminishing forest reserves, unpredictable climate and wildfires. It can be used to hydrate and moisten skin that has become dry and chapped from abuse of the elements, to promote elasticity and for long lasting protection. How to apply: Apply delicately on the skin after cleansing. Suitable for all skin types and all ages.Be careful of bee allergy. Test prior to use. In the unlikely event of a negative reaction, consult your medical practitioner. Note: As honey is an organic compound, some natural separation may occur which is not indicative of damage to the product.Store below 25℃. Tips: In the evening – Sleep with the multi-balm applied on the face or wash away before sleep. Your face will be energized and softened in the morning, ready for glowing make up result. Mediactive ® 20+ Honey 30%, aloe barbadensis (aloe vera) leaf juice powder, Chamomila recutita (chamomile) flower extract, Aloe Vera, RoseHip Seed Oil, Olea europaea (olive) leaf extract, Adenosine, White petrolatum, Butyrospermum parkii (shea butter), Carica papaya fruit (pawpaw) extract. Sugars, Artificial flavour, Artificial colour, Mineral oil, Sodium dodecyl sulfate.